Nepal Baseball Clum Laligurans, President Yohei KOBAYASHI, invited 13 junior baseball players led by President Pradeep Shrestha of Nepal Baseball Federation, with the help of generous supports by a number of organizations and individuals. Deputy Leader, Narayan Prassad Bhandari, Principal of Balbhadra Secondary School and Manager Iswor Thapa (a former player of 06Bulls) and Coach Anil Pariyar were the other officials. During the 10 day tour starting from Osaka, the Nepal boys toured nearly a dozen places of west, central and northern parts of Japan. In earthquake stricken Fukushima, they were guests of professional game of Tohoku Rakuten Golden Eagules and in Tokyo, Yomiuri Giants invited the team to Tokyo Dome. President Pradeep and two other officials visited Baseball Federation of Japan, co-organizer of the event, and exchanged views on how best to promote baseball in Nepal by bearing in mind joint drive to reinstate baseball and softball to 2020 Tokyo Olympic. 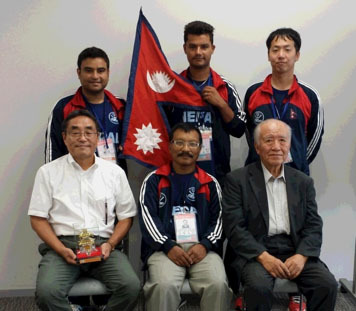 Club Laligurans and Poole Gakuin University (Sakai City, Osaka) are instrumental to introduce baseball in Nepal and continue their activities since 1999.